IBM(64%), Ralph Lauren(14%) and Jaguar(12%) make up 90% of the share of voice of brands on Twitter, with IBM as the clear leader. The Economist mentioned IBM in a tweet sharing the story of Watson, a Wimbledon-present IBM technology. Although the content features no hashtags, the influencer status of the Economist connected the news to an estimated global audience of 14.6 million. The Jaguar twitter account received the highest volume of retweets throughout day one. 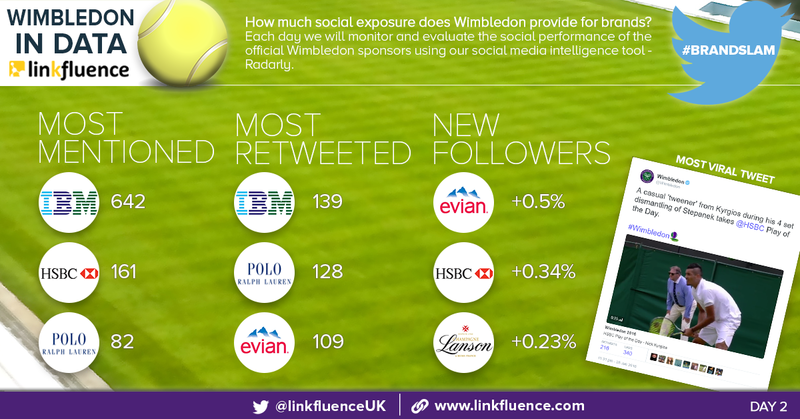 Their best performing post mentioned @Wimbledon and included campaign and product specific hashtags. The vehicle chosen is described as both a family car and a sports car, gaining interest and encouraging engagement from a wide audience. While likes were given by a variety of social media users, a large majority of retweets were from motor enthusiasts and Jaguar fans. This highlights the supportive nature of Jaguar fans but also suggests that the interaction with members of the Wimbledon community isn't as strong. 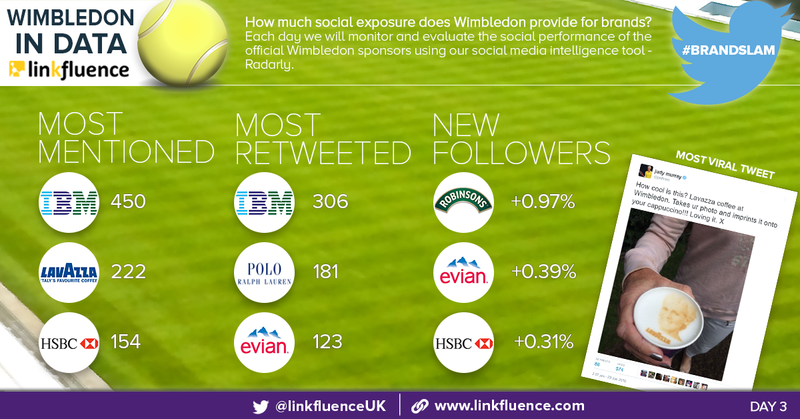 While the staple top three (IBM, Jaguar and Ralph Lauren) storm ahead with volume metrics due to their already established position on social, we looked at the follower growth of all eleven brands in order to understand brand awareness as a result of Wimbledon. Despite only making up 1% of the share of voice of brands, Lanson's follower growth(%) exceeded that of the other ten brands. 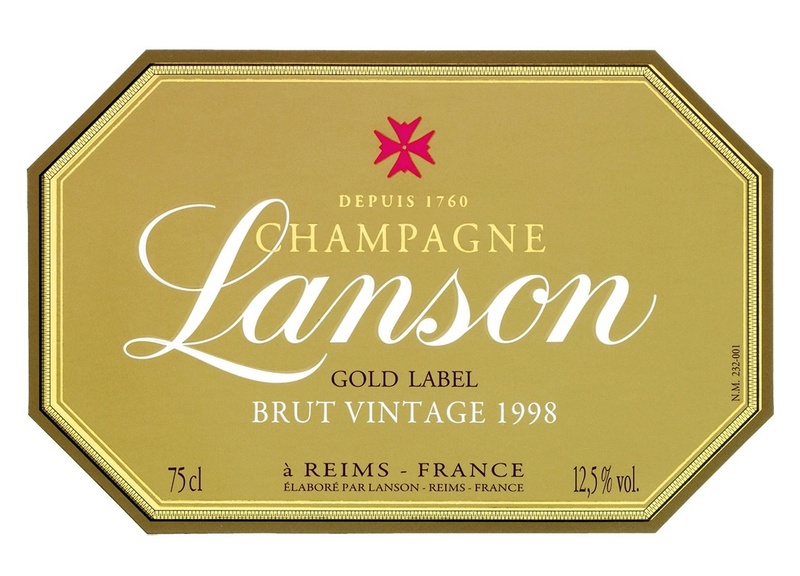 (Identified) conversation sentiment surrounding Lanson was 100% positive, indicating that these endorsements were perceived and believed, leading to an increased following. In second place for follower growth is Slazenger, yet Slazenger plays a totally different game to Lanson. On the 23rd of June, the official tennis ball supplier, pinned a call-to-action tweet to their profile page - a competition to boost follower metrics and engagement. IBM remain in first place for the number of mentions and have climbed to the top of the retweet leader board. However, Jaguar takes a back seat and loses both of its positions in the #BrandSlam. 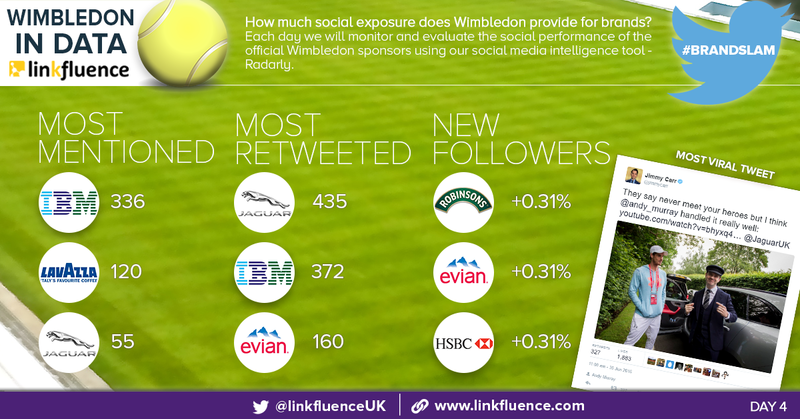 A surprising result considering the promoted twitter trend #FeelWimbledon was pushed by the @Jaguar_UK account. According to Sprout Social, in 2013, promoted trends on twitter were priced from $200,000 per day, bringing to question - the effectiveness of paid media. Official banking partner HSBC takes second place on the followers leader board and jumps straight into second for most mentioned. Occupying 16% of share of voice for brands, HSBC boasts a higher percentage than that of the runner ups in this category yesterday (Ralph Lauren: 14% and Jaguar:12%). The fruitful entrance of HSBC is a result of their Play of the Day campaign and a particular clip of Nick Kyrgios gaining a point against Stepanek with a sneaky ‘tweener’. The official Wimbledon Twitter page tweeted this video referring to the campaign, acquiring almost 700 engagements and reaching a potential global audience of 2.28 million Twitter users. 84% of HSBC’s mentions for Day two consisted of retweets of this post. 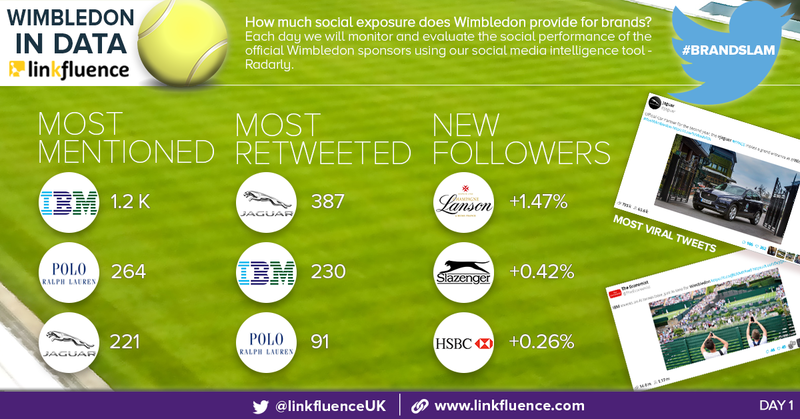 This year, the official Wimbledon social accounts are circulating a large amount of content around this year’s sponsors, giving each sponsor a great level of exposure. Supplier of water for the champions, Evian, enters the court and claims victory, becoming the number one brand for follower growth and third place for the most retweets. 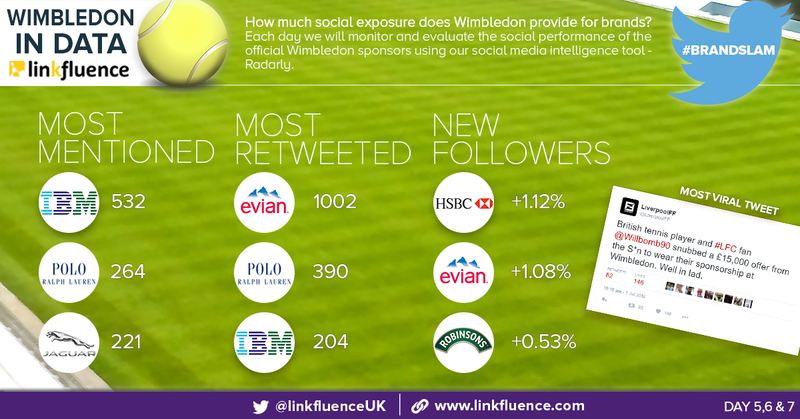 On Twitter the @evianwater account is highly reactive, particularly within Wimbledon conversation: 76% of their content is replies to tweets. Evian operate an entirely different social strategy to Jaguar. 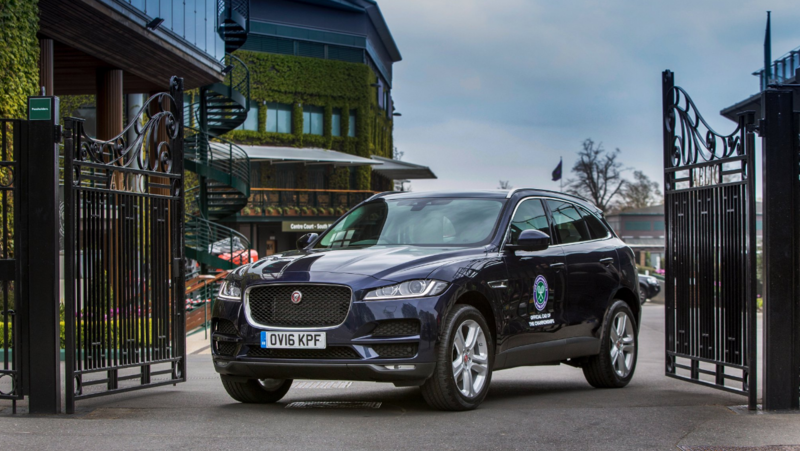 Car brand Jaguar invests in targeted advertising campaigns to organically reach more users, whereas Evian invests in community management and activates a tiered engagement strategy. Day one introduced episode one of this year’s #Wimblewatch, a campaign that was hugely successful for Evian last year. Wimblewatch is a powerful campaign as it invites celebrities with great social influence to take part, increasing exposure for the brand. Television presenter Laura Whitmore tweeted to her 382 thousand followers following her appearance on Wimblewatch round one. But who is today’s #BrandSlam winner? Day two winner Evian remains consistent with its invested community management, posting 25 times on day three. 33% of these posts were replies, motivating engagement from their followers and attracting new followers to the account. From zero to hero, Italian coffee company Lavazza secure themselves a comfortable second place for mentions on the 29th of June. But what is it exactly that they had brewing? The most viral tweet featured Lavazza and a certain Murray’s face. This tweet caused an eruption of discussion on the social web. @judmoo, the official twitter account of Judy Murray, was the second most addressed Twitter account of the day, after @Wimbledon. The Daily Mail also picked up the content and shared a story about Judy’s alleged business deal with the Lavazza (and HSBC and Pimms) brand. 86% of all Lavazza mentions on Twitter included mentions of Murray, leaving the brand with just 14% of non-Murray related posts. However, Lavazza gained global recognition, twitter users were posting from five continents, and conversation employed an impressive sentiment rating of 100% positive (based on sentiment identified content). UK convenience store brand Londis hosted a competition on Twitter as part of their #winitwednesday campaign. Seeking maximum potential, the brand hosted a timely competition around Robinsons, encouraging users to RT and follow their account to win bottles of the good stuff! The post, that tagged the Robinsons Twitter account, gained 1.6 thousand retweets and 500 likes, and by incorporating the Robinsons twitter handle into their tweet, it directed consumers to the Robinsons Twitter page. As well as featuring in an outsider campaign, Robinsons has been promoting its own competition. 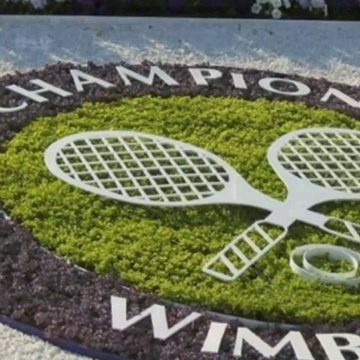 The aim is for followers to take and post a creative Wimbledon-esque photo accompanied by the hashtag #TasteOfWimbledon as well as @drinkrobinsons to be in with the chance of winning tickets to the tournament. This competition is daily, sparking a high level of interaction from contenders, and ultimately enhancing awareness and visibility for the brand. Further exposure was given to the brand… Girls Aloud band member, Kimberley Walsh, and this year’s BGT winner Richard Jones, (a combined follower count of 716 thousand) tweeted the @drinkrobinsons Twitter account sharing their gratitude for their Wimbledon invitation and ‘fruit face’ received from the sponsor. A social media strategy consisting of influencer marketing and a call-to-action promotion placed Robinsons in first place for follower growth on day three of the tournament. Lavazza remains to be in the top three most mentioned brands, indicating the effectiveness of Judy Murray’s endorsement. On day three, 86% of Lavazza mentions focused on Judy Murray and her involvement with the brand, however on day four, only 37% of mentions discussed Murray. 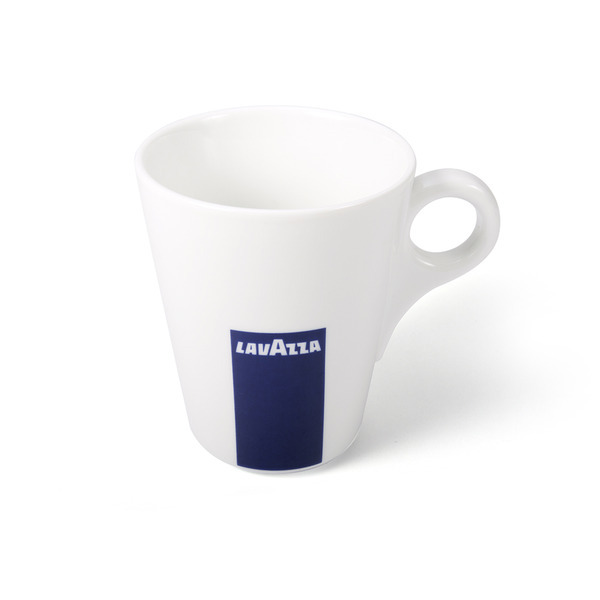 Posts centred more around the technology offered by Lavazza, and even caught the eye of the media, including Forbes and Yahoo UK News. Jaguar has hit acceleration and parked comfortably in two categories, bumping IBM to second place for retweets. But what drove this result? The brand amplified excitement around the event with their use of Out-of-Home advertising on day three. On day four Jaguar ignited the digital realm. The luxury car manufacturer aired episode one of Secret Chauffeur - a short video series adopting a James Corden carpool panache. To kick off the series, the secret chauffeur for Jaguar’s ambassador Andy Murray, (dubbed by Jaguar as ‘The grumpiest man in tennis’) was English funny man, Jimmy Carr. An interesting juxtaposition. Despite the inactive nature of Murray’s twitter account, posts from Jaguar and Jimmy Carr animated engagement, harvesting nearly 500 retweets and over 2000 likes, in just two single posts. Reaching a potential global audience of eight million. We’ve just witnessed the first weekend of Wimbledon and it was certainly shocking, as we said goodbye to world number one, Novak Djokovic. But, what happened in the world of brands? 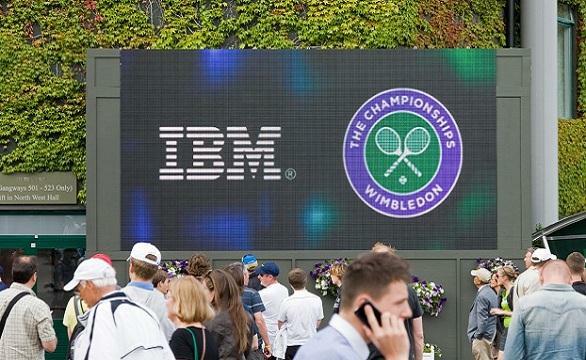 Data supplier, and all-round power-sponsor IBM continue in first place for brand mentions and have secured this space for the entire first week of Wimbledon. 61% of conversation around the brand consisted of original content - demonstrating that twitter users are firstly - impacted by the brand and secondly - have something individual to say about it. Not only is the brand prompting organic content from the public, Radarly has rated the conversation sentiment at 100% positive. Interestingly, the @IBM official twitter account rarely posts about Wimbledon – there was just one Wimbledon related post (a retweet) across day 5, 6 and 7. This analysis proposes that the brand is often talked about but not necessarily talked to, yet social media research concludes that this does not affect IBM's reputation or messaging. The above word cloud highlights the keywords within IBM conversation, a proportion existing of tech jargon such as ‘data’, ‘analytics’ and ‘big data’, confirming that user-generated content around the brand is true to the brand’s identity as a data supplier. Evian is one of the quirky brands within #BrandSlam, exercising a variety of content from GIFs and videos to retweets and links. The water supplier activates a reactive channel strategy, and consequently a persona. Evian’s digital identity establishes the brand as relatable and human, which ultimately drives engagement with the account. Over the first weekend of Wimbledon, the Evian account welcomed over one thousand retweets, the largest number of retweets for a sponsor so far in the tournament. This individual tweet received twice the number of retweets for all posts on the Ralph Lauren account over the weekend. An impressive figure when comparing the number of followers for each account: Evian – 32.7 thousand, Ralph Lauren – 1.83 million, proving that a reactive strategy and humorous, relatable posts mean points.